The E Ink blueChute concept is just what e-ink (confused?) needs to get us excited again. 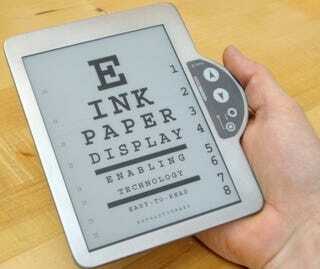 Sure, it has all those energy efficient and ease of reading benefits just like its predecessors, but never before have we seen e-ink displays with this combination of sexiness and general utility—plus we could always use another eye chart. The inventor points out that at just 5mm thick, the blueChute is thinner than a Nano, while still making room for a MicroSD slot and Bluetooth. So not only is the design very portable, but its functions can include email/weather/news streaming (say from your phone) on top of the traditional Daniel Steel eBook stereotypes.